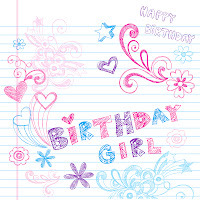 Sometimes young ladies are quite hard to buy birthday gifts for, especially those tough tween years when they are moving from being a little girl to a teenager. They no longer play with dolls, but they are too young for teenage gifts like makeup and clothes. Chasing Treasure has the perfect gift idea for you! The Reed and Barton hard to find Pure White Jewelry box is a very special box that we carry. Beautifully crafted from hardwoods, this box is finished in white with extra detailing that includes a silver border accent on the drawer and detailed beading on the front corners. Inside this lovely jewelry box offers a lot of storage are for these extra special items young girls love to collect. 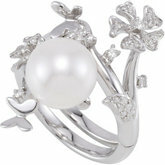 There is a jewelry well, lined in pearl white flocked velvet, that accommodates rings, bracelets, and earrings. They also added a very nice necklace drop that gives her convenient and secure storage for necklaces on pendant hooks that allow necklaces to drop down into the back of the box. This is a great feature in a jewelry box! This beautiful box also comes with additional storage via a drawer with 4 earring compartments and one long area for pendants. A full mirror is in the lid and a silver bar for the drawer pull accents the silver border detail. This is a beauty of a jewelry box that any lady would love to own regardless of age. For an extra special gift for birthdays and special occasions take a look at our gorgeous white hardwood jewelry box. Your favorite girl is going to love it and you are going to love gifting this special piece. Click here to check out all our tween and teen jewelry boxes for girls. A growing and popular jewelry trend is grandmothers, mothers and even aunts who pass down their special jewelry pieces to their children and loved ones. Today I'd like to share some tips with you on how you should be protecting those vintage jewelry pieces that are passed down to you from beloved family members. You should always clean each piece of jewelry before placing it into storage and they should be completely dry from whatever cleaning method that you used. If any piece is broken it is advised that you take it to a jeweler right away to be fixed. Whenever possible your vintage jewelry pieces should be stored in fabric pouches that are lined with some fabric padding to help protect your heirloom pieces. You should only store one piece at a time in this type of fabric pouches; never place multiple pieces into the same pouch as the can bump up against each other causing permanent damage. The pouches with zipper closures or snaps work the best as they tend to keep your pieces secured nicely inside. Once you have then nicely secured in a fabric pouch it is advised that you place your pouches in a nicely lined jewelry box or armoire as this will further protect your family heirlooms from damage and keep them all contained in one single place. If you don't wear your vintage jewelry very often it is best to open up each pouch twice a year to check your pieces. If pieces were set into sterling silver they can tarnish even if protected in a fabric pouch and those pieces will need to be cleaned twice a year. Receiving beautiful heirloom antique jewelry is wonderful and the next generation to get these pieces will be thrilled to receive them in perfect condition. One of the world's most famous, well known gemstones has to be the Hope Diamond. The Hope Diamond, also known as the French Blue, is believed to have been mined from the Kollus Mine, in Golconda, India back in 1668 and was purchased by Jean Baptiste Tavernier and later sold to King Louis XIV of France. The Hope Diamond was originally a 112+ carat diamond and over the years has been re-cut several times and as of today it weighs 45.52 carats. The rarest of the rare, this diamond is a fantastic beautiful violet blue color. The color is from trace amounts of Boron that are naked to the eye. It also emits a red phosphorescence glow of sorts, after exposure to ultraviolet light. Because of this phenomenon, it is considered by many throughout the years to be cursed. The Hope Diamond has traveled far in the hundreds of years it has been in existence. It has been owned by many different people in countries all over the world and even considered to be a stolen gemstone too. Its last owner was the famed Harry Winston, who passes away in 1978. He was persuaded to donate the gem in its necklace setting to the Smithsonian Museum of Natural History where it is the 2nd most visited historical piece in the world, after the Mona Lisa. The setting of the diamond has changed many times over the years. 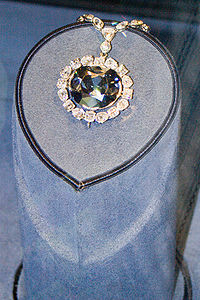 Currently the pendant portion of The Hope Diamond is in a setting that is surrounded by 16 white diamonds that are done in the pear shape and cushion cuts. The necklace itself is made up of 45 white diamonds so it is a weighty, luxurious piece. It is estimated to be valued at $250 million dollars, but it actually considered to be priceless because of its extensive history. 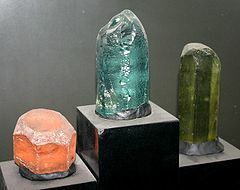 The Beryl Family of gemstones includes the popular Emerald (green Beryl) and the popular Aquamarine (light blue) semi-precious gems but the Beryl also comes in several other colors like red, gold-yellow, yellow, yellow-green, pink and even in a beautiful colorless version. When you find Beryl in the pink color it is referred to as a Pink Beryl or Morganite and when you find it in the gold-yellow color it is referred to as a Golden Beryl or Heliodor for the greenish-yellow shades. As you can imagine, the gemstones in the Beryl family are highly prized and beautiful stones. Emeralds have been prized for hundreds of years and have graced jewelry pieces from a King's or Queen's crown down to a lovely every day emerald ring or earring. 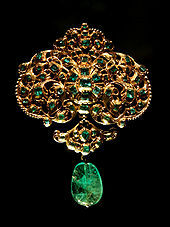 Pictured here is a Spanish emerald and gold pendant on display at the Victoria and Albert museum. The gemstone comes in at 7.5 to 8 on the Mohs hardness scale so it is a semi-hard stone. With that said it is highly sensitive to pressure, extreme heat, extreme cold, water submersion and household chemicals. If your Beryl jewelry needs a light cleaning we recommend just wiping it down with a slightly dampened cotton cloth. If it needs a more heavy duty cleaning, it is best left ot a professional jeweler. When it comes to storing your highly prized Beryl jewelry you need to place them in a nicely lined and cushioned jewelry box. You never want to pile additional jewelry pieces on one another. Rings should be stored in ring rolls, necklaces and bracelets either hung or laid flat. It is best to keep your jewelry box closed so that direct sunlight and moisture doesn't get in to ruin your expensive jewelry pieces. If you have been thinking about housing all of your jewelry in a convenient storage space, then you should consider getting a jewelry box that fits the needs of your collection. Jewelry boxes range in size from small leather travel wallets to large floor standing wooden boxes. This article give a survey of the various options open to you as you go about selecting a jewelry box that is right for you. The most common and traditional form of jewelry storage is the wooden jewelry box. These boxes come in various sizes beginning with small dresser-top boxes and finishing with large floor standing wooden armoires. In between you can also find medium and large boxes that will fit on dresser tops. The smallest wooden boxes are earring, cufflink, ring and pendant boxes that are as small as 2 1/4 x 2 1/4 x 1 3/4" to hold individual items. If you have more jewelry, the a medium size dresser top box measuring at least 10 x 7 x 6 inches might be appropriate. Larger dresser top jewelry chests or floor standing armoires are the best options if you have an extensive and varied collection. In the same way that you prize your jewelry pieces, you can also select a jewelry box which is itself a luxurious and beautiful item. Luxury jewelry chests are usually handcrafted and have striking wood finishes such as mahogany, teak, maple or burlwood. Partially or fully handcrafted, luxury chests feature piano finishes, compass hinges and luxurious linings. High end jewelry boxes range in price from $200 to over $700. Wood is not the only medium for jewelry boxes. Leather is a versatile material that is found in jewelry storage pieces in all sizes and styles such as leather travel wallets, jewelry rolls, portable train cases, safety deposit cases, watch storage boxes, dresser top boxes and even huge leather trunks. Leather jewelry boxes come in a variety of colors such as black, tan, white, green blue, red and even pink. The type of collection that you have may also be a factor in which jewelry box you select. If you have a lot of necklaces then you should take a look at necklace armoires. There are dresser top mini armoires with compartments enabling you to hang the necklaces, and for larger collection you can select from either floor standing armoires or wall mounted mirrors. All of these boxes have side doors specifically made for hanging necklaces tangle-free. If your jewelry collection is varied, then you have to consider the specialized dividers that are features of many jewelry boxes. You can find boxes with compartments for fashion earrings or bars for pierced earrings, padded rolls or deep storage for bangle bracelets, hooks or horizontal lined sections for chain bracelets, padded ring rolls for rings, padded rolls or lined compartments for cufflinks, hooks for necklaces and removable padded watch pillows for watches. Not every jewelry box has all of these specialized compartments so think about what you really need and then pick a box that has the areas to fit your items. Sometimes it is easy to find the box that you need. For example, if you are searching for a box to hold one or two special pieces or a box that will be part of a special present, then a trinket box is appropriate. These boxes are crafted from fine brass or pewter with hand enameled details. They sometimes have hand set Austrian crystals and 24k gold accents and make perfect keepsake gifts for the serious collector or someone special on your gift list. Finally, if you really want to make an impression on someone then you can choose a wooden jewelry box that is specifically made for the presentation of a particular jewelry gift. You can find boxes for engagement rings, watches, earrings, pendants and necklaces. 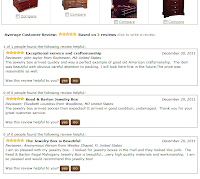 So, consider what kind of jewelry storage you require, and then have some fun exploring the wide variety of jewelry boxes that are on the market today. 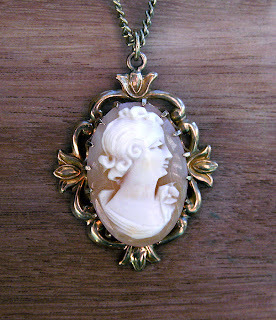 By Linea Riffel, contributing editor for ChasingTreasure.com, where you can purchase wooden jewelry boxes, floor jewelry boxes, leather travel cases, presentation cases, trinket boxes and more! Axinite is a rare semi-precious gemstone that is rarely seen out in jewelry stores but if you do come across a piece of Axinite jewelry it is an extremely beautiful gemstone and would make an exceptional addition to your jewelry collection. Axinite is mined from Brazil, Mexico, France, Sri Lanka, Russia, Tanzania and Pakistan. It comes in on the hardness scale 6.5 to 7 so it does need to be handled with some care. It is best used in necklaces and earrings since those pieces of jewelry don't take a beating like rings and bracelets. The color play on this gemstone is simply beautiful. 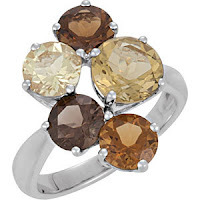 You will find it in a light golden brown to reddish brown, similar to a Smokey Quartz but not as intense in color. This gemstone is usually moderately priced but not as expensive as a gem like Tanzanite. Just like all semi-precious gemstones, you want to take some care with your Axinite Jewelry. 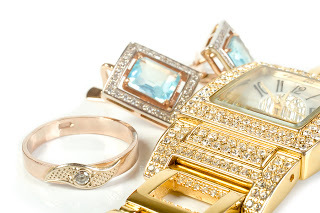 You never want to submerge your jewelry in water or cleaning agents. If it gets dirty and needs a light cleaning you can simply wipe it off with a slightly dampened cotton cloth. If you find that your jewelry piece needs a more heavy duty cleaning then its best to let a professional handle it. You need to store your jewelry in a nice protective lined jewelry box and don't stack other jewelry items on top if it. Also never store your jewelry in extreme heat, extreme cold or in moisture-rich environments as it can damage the delicate stone. Spring is here and vacation planning is on our minds. The weather seems to dictate plans and that in turn dictates clothing and jewelry accessory choices too. Well, we have a lovely solution for your packing issues because if you are like me over packing is a given! The jewelry travel rolls at clutches at Chasing Treasure are going to be your best friend this summer. New in our jewelry box store are beautiful leather jewelry rolls and clutches that solve the dilemma of what jewelry can I take with me that will not end up in a giant knot at the bottom of my travel case. Sound familiar? Our newest leather jewelry roll comes in five beautiful colors and rolls up tight so you can slide it into any nook and cranny left open in your suitcase or overnight bag. It features two zippered compartments, an earring holder and a ring holder, each protected by suede flaps and a snap out zippered traveling roll in matching leather It is made of signature embossed fine grain leather and suede trip and it is just beautiful! Also new to the shop is our stylish travel jewelry folder. This gorgeous piece is a classy jewelry envelope perfect for the frequent traveler. A lovely leather bow keeps it closed securely and it features a zippered compartment for trinkets and accessories, one earring holder and one ring holder plus a snap out jewelry pouch great for bracelets and necklaces. It is made of high quality signature grain fine leather and suede trim. These are just two of our awesome jewelry rolls that are going to make your vacation travel a bit less stressful. Easy to use and affordable, these jewelry pouches are just the right size for any carrying case you choose and you know it will arrive protected, ready to wear and not in a pile of knots. Bon Voyage! Click here to shop all our travel jewelry boxes, rolls and cluthches. We hear the term TWEEN a lot these days and the marketing gurus have been capitalizing on marketing specifically to this age group successfully. What is the definition of tween specifically? 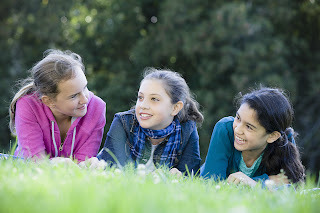 Tween has been used to describe children between the ages of 8 and 14 years of age. This age group has been trend setters in jewelry and fashion for several years. Let's take a look at what is trending for Tweens in jewelry for this Spring. For tween girls this season we are seeing a few different necklace trends such as birthstone pendants, heart pendants or monogrammed key pendants, initial pendants and peach signs. Many times they will layer the necklaces and wear several at one time. Tweens are also sporting darling ribbon band watches with sterling silver or silver tone round watch faces this spring season. Another popular item is the handcrafted jewelry made from ribbons, braided leather cords, buttons and beads that are all very hot and trendy this year. Boho style necklaces are also very popular right now and you will usually find boho styled pendants dangling from colorful ribbons, vinyl or leather cords. When it comes to earrings you will find boho style dangled earrings to go along with their matching pendants. 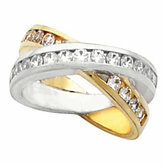 Rings are hot and trendy but look for sterling silver or 14 kt. 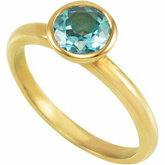 gold initial rings for your tween or look for simple birthstone solitaire rings set into the same semi-precious metal. Don't forget stacking rings is still a great look that the kids love. Tweens love jewelry and setting trends at this important age. If you are looking for great trend jewelry for your tween, this list will head you in the right direction! Check out our great selection of jewelry boxes for tweens here! When looking for the perfect gift, come on over to Chasing Treasure and see our fabulous selection of lovely gift ideas. Today we are featuring our amazing collectible trinket boxes. Trinket boxes have long been a collectors dream with their fine detail and wonderful designs. The Trinket Boxes we carry are beautifully adorned with crystals that sparkle with style and imagination. Meticulously crafted from fine brass or pewter with hand enameled details, hand set Austrian crystals and 24k gold accents, our bejeweled trinket boxes are perfect keepsake gifts for the serious collector or someone special on your gift list. For gift giving, nothing makes a bigger statement than to give your loved one a fine jewelry piece inside one of the gorgeous trinket boxes. Getting engaged? Can you imagine your intended's face when she opens a crystal encrusted trinket box and finds a sparkling diamond inside? For pet lovers, our selection includes amazingly detailed animals like frogs, giraffes, ladybugs, peacocks, elephants, zebras, cats, dogs and so many more. You cannot go wrong with a gift like this. Many statues of the animals, like the elephant and frog, are in fact good luck charms to many people and they will be thrilled with your thoughtfulness. Other collectors will love our crystal encrusted eggs, flowers, purses and so many others. I know that you will be the talk of the town when you give a thoughtful gift like these gorgeous trinket boxes from Chasing Treasure. From baby showers to graduations and holidays, trinket boxes make memorable gift. Fill them with gorgeous jewelry or special mementos like a loving note, photo or memories from a date or experience and watch the smiles overtake their face when they unwrap this special gift. Click here to shop all Crystal Trinket Boxes. If you are a jewelry lover, learning as much as you can about the different settings and terminology used to make a jewelry piece can be important. Here is some help with your setting terms so next time you go to buy a piece, you know what to expect. * Bar Setting - This type of setting utilizes a strait bar that is typically shared by two to three gemstones to hold the gemstones in place. * Bezel Setting - In a bezel setting them gemstone is completely surrounded by metal on all sides and can be used with just about any shape or sized gemstone. * Channel Setting - This type of setting is often seen in bridal jewelry but can also be seen in other styles of jewelry too. The gemstones are place side by side and set into a channel of metal with no other metal separating them. 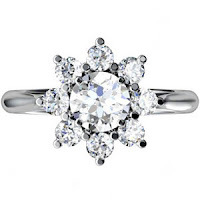 * Cluster Setting - This type of setting is often seen in cocktail rings and cocktail earrings. A jeweler will take several small stones and surround a larger gemstone with them. This is a great way to utilize small gemstones and make a solitaire appear much larger since it is surrounded by many smaller gemstones. 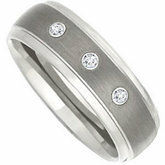 * Gypsy Setting - You will often see men's rings utilizing this type of gemstone setting. A single gemstone is set into a thick band of metal. 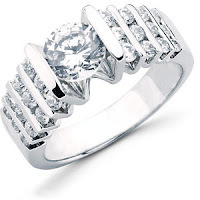 * Prong Setting - This type of setting is when a gemstone is set into metal and has "prongs" or "claws" holding onto it. * Tension Setting - This type of setting is gaining popularity with those who don't like a lot of metal surrounding their gemstones. In this type of setting, the gemstone is held into place by the "pressure" of the metal it has been set into. Jewelry is such an expressive fashion accessory. By adding a specific piece to your outfit you can change your look from dull to wow. Really simple items such as rings can also make an impact on your fashion style. Let's take a look at what is trending now for fashion rings in Spring. * Bali-Style rings are all the rage right now and if you are not sure what to look for here is a tip: Look for fashion rings that are encrusted with metal bead work and faux gems or rhinestones. These rings tend to be moderate in size to very bold looking. * Romantic-Style rings are always in style and we are seeing rings done in floral designs or in heard shapes all over the Hollywood starlets this season. 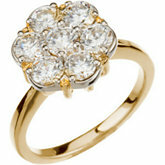 You can sport a dainty heart-shaped pinky ring or go all out with a big bold flower motif ring. * Coil and Wrap rings are also in high-fashion style right now! The ring should wrap or coil around your finger 3-4 times. If this is too bold of a look for you then try a simple bypass-style ring on your pointer or middle finger. 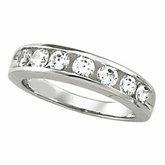 * Expansion Band rings (stretch rings) are great for those of you who tend to swell up or retain water in your fingers. Just like a watch with an expansion band. These types of rings are great for those of you who have issued with traditional rings. We have been seeing expansion band rings in bold florals, animal motifs and even a few with watch faces this season. Look for a few of these cute trendy ring styles this season and you can make your fashion statement big and bold or sweet and simple. If your jewelry collection is overflowing with rings, purchase ring holders or ring jewelry boxes to keep them within easy reach, organized and ready to wear with that perfect outfit. There is a unique stone gaining popularity in the jewelry marketplace and it's called Andesine or Andesine-Labradorite. Let's take a look at some information on the stone and tips for maintaining its beauty. Andesine is a silicate mineral and member of the group of minerals known as feldspars. Andesine was first noted in 1841 for an occurrence in the Marmato mine, Marmato, Cauca, Chocó Department, Colombia. The name is for the Andes due to its abundance in the andesite lavas in those mountains. The hardness of this stone comes in at 6 to 6.5 on the Mohs scale so it does need to be handled with care and taken care of properly. Due to it being semi-delicate in nature, it is best not to be set into rings that you wear every day, but it is great set into earrings, pins and pendants. The Andesine is really a stunning looking stone when you see it. 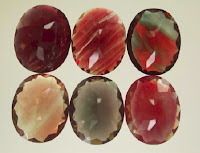 It comes in a range of colors: red, honey-red, orange, yellow, champagne and green and it is a unique gemstone. Cleaning: When it comes to cleaning jewelry pieces that have Andesine stones, they need to be cleaned very gently. You can use a homemade solution of 2 drops of mild liquid dish soap mixed with a 1/2 cup of warm tap water and use that solution with a clean, soft, lint-free cloth to clean your pieces and then towel-dry with another clean, soft cloth. Do not use harsh chemical cleaners, ultra-sonic or steam cleaning devices to clean this type of jewelry. Storing: Store all of your Andesine jewelry pieces in a nice lined jewelry box in a single layer (not stacked onto other jewelry pieces) to keep them damage free. Warnings: Never wear this type of jewelry while swimming, bathing, showering, cleaning or washing your hands as water and chemicals can damage the stones. Do not store this type of jewelry in extreme heat, extreme cold or in direct sunlight. At Chasing Treasure we understand how difficult it can be to make a choice from our large selection of fabulous jewelry boxes. We offer hundreds of different styles, shapes and sizes to bring you the best selection we could possible find. With that said, we also know that they are all gorgeous and it is tough to make a choice. One great way to make an impression with a gift of a jewelry box is to see our selection of Personalized Jewelry Boxes ready to go with a free engraved name plate. These boxes include free engraving of your intended's initials, monogram, full name or even a special message, all available in your choice of Script or Block font. What a great idea to take a fabulous gift from generic to personal! The selection of jewelry boxes available with free engraving are all handcrafted with amazing woods like Ebony, Mahogany, Sapele and other unique, special woods. There are boxes of all sizes in regular styles and in valet styles with multiple drawers and compartments; all of them beautifully lined in satin or velvet to cushion and keep treasured jewelry pieces safe and sound. Choosing a lovely gift from our personalized jewelry boxes with free engraving will help you select a lovely gift quickly and easily so it can be in the hands of your recipient before you know it. We take the hard work out of your gift selection process and offer you the finest products at wonderful prices every day. Let us help you with your next gift purchase. We think you will be impressed. Marilyn Monroe was the blonde bombshell that starred in many hit films like Gentlemen Prefer Blondes, How to Marry a Millionaire, Some Like it Hot, The Misfits, The Love Nest and many more. She was one of the most photographed women in history and is still in the hearts and minds of many even today. It is well known that Marilyn love expensive jewelry and was very fond of glistening diamonds and sapphire jewelry, worn either separately or combined together. She was a trendsetter for everything from fashion to accessories. Men and women alike just adored Marilyn and would copy just about everything she would do. When it came to her jewelry choices she was all about the glitz, sparkle and glam. One of Marilyn's most famous pieces of jewelry happened to be a gorgeous platinum and diamond wedding band that was given to her by Joe DiMaggio, the famous baseball player, on their wedding in 1954. The wedding ring had 35 baguette-cut diamonds set into an eternity style band ring. The beautifully cut diamonds in this ring go around the entire circumference of the band and was prized by Marilyn for many years. Later, after her passing, the ring was sold at auction for 772,500 to an anonymous bidder. 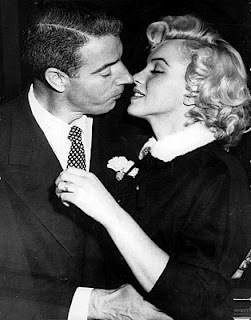 Marilyn was also given a beautiful pearl necklace by DiMaggio during their honeymoon to Japan. This was a stunning 16 inch strand of pearls containing 44 matched pearls by the famous jewelry Mikimoto. 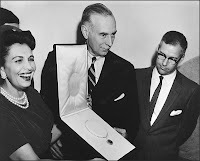 It is said that Marilyn gave the necklace to friend Paula Strasberg. Paula's daughter Susan Strasberg, the actress, returned it to Mikimoto in 1988. Marylin's style and grace made her a perfect model for many beautiful pieces of jewelry which can be seen in her movies. When it comes to trying to describe something about a piece of jewelry, it can be difficult to do so without knowing the proper terms. I know I have made up words to refer to an area of my ring like do-hicky, for example, so I am sure that you may struggle with the right jewelry terms now and then too. Let's take a look at some Jewelry Terms for Rings that you can use when you need to describe your ring. Profile: This describes the height of the ring's setting. Shoulders: Similar to the term shank but often refers to the part of the ring leading up to the gemstone setting. 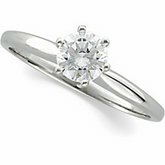 Solitaire: This term is used to describe a ring that has one single gemstone set into it. Shank: This term describes the part of the ring that surrounds the finger. Mounting: A piece of jewelry - in this case a ring that does not have any stones set into it yet. Gallery: This term refers to metal strips used to make settings for stones in rings and other pieces of jewelry. Collar: This term is used to describe a molding or bands around the stone. These general terms should help you next time you need to describe your ring to others or even design a ring. But even if you forget some, I think most people understand the term do-hicky too. When the weather warms up and the sandals come out, so do fun Ankle bracelets. With spring and summer right around the corner, now is a great time to take a look at this trend that is delicate and fun! Here are some great ideas on this seasonal jewelry fashion trend to add to your jewelry box. Right now in the stores are pretty two-tone anklet bracelets in a white metal with yellow metal stations or accents. Also coming up are good-quality tri-color ankle bracelets with white, yellow and rose-toned metals. They look great and many ladies love layering up several different chain ankle bracelets onto one ankle. Heart themed jewelry is always in style and this season we are seeing a lot of the leading trend setters sporting around chain-style ankle bracelets with heart stations or with dangling heart shaped charms. Many of these leading ladies have diamonds or crystals set into the hearts for that sparkling look. You can also find gemstones and pearls in the designs too. If you are looking to invest in an ankle bracelet that will last you for years and one that will stand up to the abuse that an ankle bracelet goes through we recommend investing in a sterling silver or 14kt gold Byzantine chain link bracelet. These are usually very sturdy chains due to the nature of the Byzantine design and thinner, more delicate chains may break easily. 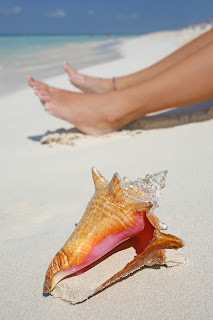 If you spend a lot of time in pool water or at the beach, try to avoid wearing your ankle bracelets that pearls or gemstones on them. Water an ruin pears and gems! Your best bet for premium jewelry care would be to remove delicate anklets before swimming and make sure you rinse them and wipe try after swimming in chlorine to protect your investment. Whether it's rings, earrings, cufflinks or watches, most of us have a trademark jewelry style we wear often that leads to a growing collection of our favorite accessory type. Jewelry boxes are traditionally designed to hold a mixed collection of a various types of jewelry. In most jewelry boxes you'll find a balanced assortment of divided storage compartments for earrings, larger compartments for bracelets or brooches, padded ring rolls for rings, hooks for necklaces and possibly a couple watch pillows. For collectors that favor a particular type of jewelry, a traditional jewelry box design doesn't always offer the storage space needed. When a collection consists mostly of one type of jewelry (be it earrings or cufflinks etc) there are a few wonderful solutions to choose from. If your shopping for someone on your gift list that enjoys a particular type of jewelry, you can't go wrong with one of the choices below. For large collections of earrings or cufflinks, you'll find the ultimate storage solution in our collectors jewelry box made of fine wood with a faux burl finish and ebonized edge. With two lift out trays featuring 59 individual storage compartments for earrings, rings or cufflinks, it provides a convenient and beautiful way to store a fine collection. With a sleek design and piano glass finish, it is suitable for men or for women. It makes a fabulous personal gift that will be treasured for years. For the serious ring collector, one of these boxes may not be enough! Padded rolls keep 18-24 valuable rings protected and stored properly while a key lock provides added security. It slips easily into a safe while you're away. Made of genuine Bubinga Burl Wood accented with exquisite geometric design on lid, this ring collectors luxury jewelry box will surely please. 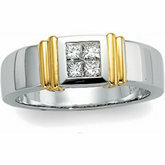 It's designed to blend with many styles of decor and hold men's or women's rings. When a watch collection grows, a glass top watch display case provides a way to enjoy your watches every day since you can't wear them all at once! Crafted in a best selling design, this wood watch box features lock, display window and storage for 10 watches in an attractive high-gloss cordovan rosewood finish. This watch box is a great gift for that someone who takes pride in displaying his timepieces. Lined silsuede interior and brass key lock complete this exquisite collectors case large enough to hold valuable men's watches and beautiful enough for women's watches. If your earrings, rings, cufflinks or pendants are scattered about in various containers and it is time to organize them neatly and conveniently, choose one or more of our sueded collectors cases. If storage is the goal and display is less of an issue, these collectors cases will fit your need to a tea. Featuring 24 individual storage compartments measuring approximately 2" square, they will hold 24-48 pieces of jewelry each and are available at a low price so you can buy as many as you need to organize your entire collection. They stack easily or slip into a drawer for your convenience. If you like traveling with your jewelry, these collectors cases provide a travel solution for your collection. These are just a few of our favorite solutions for storing growing jewelry collections. Check out more jewelry storage and display solutions by jewelry type in the jewelry storage box category at ChasingTreasure.com. When looking at a piece of jewelry that you may be interested in purchasing, it it important to note the setting the jeweler has used to create the piece. By doing so, it will help you if the piece ever needs to be repaired as well as the maintenance needed. To help you understand the terms the jewelry industry uses for jewelry settings, here is a list of seven common settings you will most likely see. Pave Setting: This type of setting is typically used when a jeweler is dealing with very small stones and those stones are set very closely together so that you mainly see a large cluster of small stones. 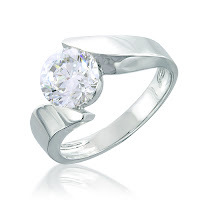 Tiffany Setting: You see this setting the most in rings and stud earrings. This setting uses 6 prongs to hold the gemstone in place. Prong Setting: Is when metal prongs clamp down and hold onto the gemstone in a piece of jewelry (usually 4 or 6 prongs per gemstone). Peg Setting: This type of setting is usually seen in pearl or gemstone bead shape jewelry. A peg setting is where a hold is drilled into a pearl or gemstone bead and a pin is inserted into place to secure it. Channel Setting: This type of setting is used when the jeweler want to set stones into a piece of jewelry between two metal channels. Invisible Setting: This type of setting is used when a jeweler doesn't want any metal to surround the stone (in regards to the stone's setting) so gemstones are cut in a way that they fit together which holds them into place. Cluster Setting: This type of setting is used when a jeweler wants to set a bunch of smaller stones together in one piece of jewelry and in this setting all gemstones are placed close together. Each setting is unique, do you have a favorite?